The San People are the first people of Africa, this means they are the descendants of the first people who ever lived there and have the same gene type. Also commonly referred to as Bushmen and well known for the distinct clicking sounds in their native tongue, they have left many intrigued about their culture and habits. Immediate attention was drawn to their culture in the 1980’s, when a South African director made the blockbuster movie ‘The Gods must be crazy’. Set in the Kalahari desert, the movie tells the story of a bushman called XiXo, who lives happily with his tribe of San, until one day a coca cola bottle falls from the sky. Convinced it must be a gift from the Gods, Xixo goes out and tries to share it with his people, but unlike anything else, there is only one bottle and the tribe gets into quarrels over it. The elders of his village tell him to drop the cursed item off the edge of the world, but this journey involves him in hilarious situations with civilization (obviously incapable of reaching the edge of the world). Little did we know then, that the Bushmen’s thousands of years old ancestral grounds in the Kalahari dessert would be taken from them soon after the release of this movie and their encounters with civilization would become day to day business. In 1984, the governments of Angola, Botswana, Namibia and South Africa had learnt about the presence of diamonds within the Central Kalahari Game Reserve, an area upon which the San have depended for their livelihood for over 10,000 years. In three big clearances, in 1997, 2002 and 2005, almost all Bushmen were forced out of their lands, their houses burnt down, their schools and health posts shut and their water supplies cemented over. The people were trucked away to settlement camps where they are not able to hunt and depend on government handouts. Although the Bushmen won the right in court to go back to their lands in 2006, the government has done everything it can to make their return impossible by cutting off any source of water. In the meantime, the government drilled new boreholes for wildlife and tourists to come and enjoy Wilderness Safaris. Eventhough there are still 100,000 Bushmen spread out over southern Africa, many of them haven’t been able to return to their ancestral grounds and struggle to keep their traditions alive. On the grand scheme of our human existence, this is therefor a pivotal time for the Khoi San, who have been suffering from severe illnesses and alcoholism since their assimilations with modernity. According to genetic research, they are the oldest people in the world, going back maybe 60,000 years. They have genetic properties which nobody else has, so this puts them at the root of the human tree and basically means we are all descendants from the San people. 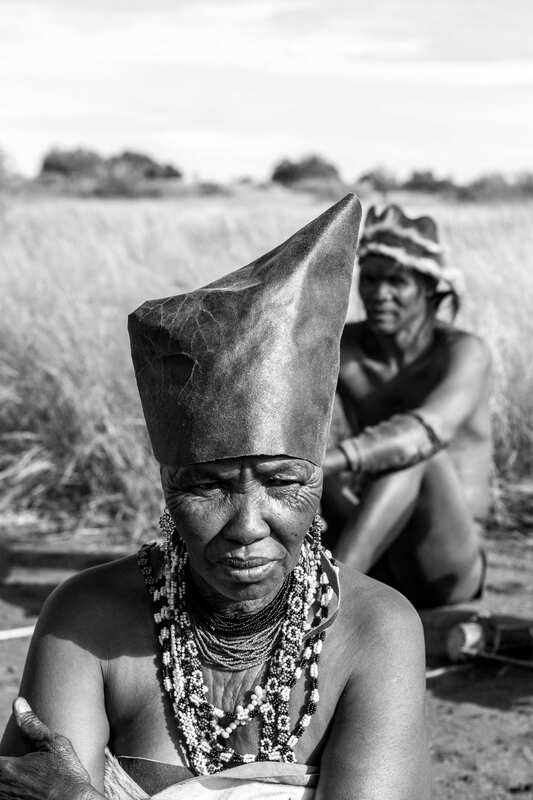 Bushmen have always been hunter gatherers, with traditionally about 70% of their diet consisting of plant food, including berries, nuts, roots and melons gathered primarily by the women. The remaining 20/30% was meat (mostly antelopes), hunted by the men using poisoned arrows and spears on hunts that could last several days. This hunting & gathering economy and the social structures surrounding it have remained virtually unchanged for tens of thousands of years until the recent displacement of their people to resettlement camps, a socio-economic culture that has sustained mankind universally during their evolution until the advent of agriculture. The Bushmen do not farm or keep livestock, having no concept of the ownership of land or animal. Strictly speaking, the San Khoi social structure can not be called ‘tribal’ because they aren’t governed by any supreme leader and their network of kinship is fairly relaxed. They are more like a loosely knit family culture where decisions are made by universal discussion. The roles of men & women are very distinct and rarely overlap, which is a characteristic almost universal amongst hunter/gatherers the world over. It is based on survival needs encouraging the most efficient utilisation of available skills and resources. Despite this being perceived as a sexist division, the importance of women is very high within the group and their opinions often take precedence, particularly where food is concerned. Much of San culture and historical events has been depicted for over 5,000 years in their famous rock and cave art, which is very distinct. The artwork involves hunters, non-humanbeings, half-humans and half-animals. The hybrids are considered representations of shamans embodying animals they sacrificed or worshipped, like the eland or antelope. We can also learn more about how the San lived through their rock art. In several depictions, the people are all in a dancing stance, and the women are clapping, so it is believed to be one of their healing or trance dances. Everyone is shown in a similar way; one is not more elaborate or more detailed than another. This shows that though the healers and shamans held special powers, they were not thought of as higher or better. Healing is not for becoming a more prominent and powerful person, it is for the good of the entire community. This is why almost half of the San people are shamans. The Bushmen of the Kalahari believe in two gods: one who lives in the east and one in the west. Like many other animist religions, they belief the spirits of their ancestors live on in this realm, but they are not worshipped, on the contrary: the spirits of the dead are thought to bring sickness and death. The shamans are there to protect their people from evil and keep the spirits at peace. Most important vehicle for apeacement is trance dance, which is also used for healing, ensuring good weather and hunting. At a trance dance the women sit around a central fire and clap the rhythm of songs. The men will dance around the women. With the sounds of the dancing rattles and thudding steps combined with the women’s songs they activate a supernatural potency that resides in the songs and in the shaman themselves. The shamans rely on hyperventilation, intense concentration and highly rhythmic dancing to alter their state of consciousness. Inexperienced shamans might fall to the ground unconscious if they can’t control their level of concentration. When entering a trance, shamans often bleed from their nose and experience excruciating physical pain. The shamans’ arms stretch behind them as the transformation into the spirit world takes place. The sight and experience of it is so intense, both for medicine man and spectator, and the occurrence of such significance, it is therefor a very common theme within the art of the San people. Many anthropologists and archeologists belief that the sometimes inexplicable depiction of some symbols and abstract figures within their rock art shows the intensity of their trance and what their altered states of consciousness might look like. Sadly, today the Khoisan struggle to maintain their traditional way of existence, and we are currently witnessing the end of their hunter-gatherer lifestyle. Many have started to transition into more modern lifestyles, and have shifted to agriculture and herding. This means that many of their original skills and insights, particularly hunting and gathering, are being lost. Their vibrant languages and traditional music and singing are no longer as prevalent, and the art of making weapons, traditional jewellery and clothing are starting to be diluted by modern western cultures. Sinchi Tribe is currently funding a self documentation project with the San //Anikhwe community in Botswana, to ensure the survival of their culture for future generations. Read all about the project here.